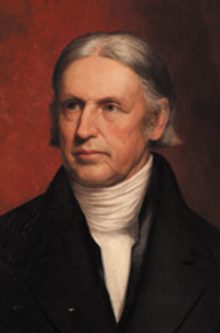 Today in Masonic History Hosea Ballou passes away in 1852. Hosea Ballou was an American theologian. Ballou was born in Richmond, New Hampshire on April 30th, 1771. His family claimed an Anglo-Norman descent, although evidence of that descent is called into question. Many believing that the family was of Hugenot decent. Ballou was the son of a baptist minister. He educated himself and devoted himself to the ministry early in life. In 1789, Ballou converted to Universalism. In 1794 he would get his first Congregation in Dana, Massachusettes. After that he would move to several churches in Barnard, Vermont (and surrounding towns), Portsmouth, New Hampshire and Salem, Massachusettes. Starting in 1817 he would take over at the Second Universalist Church in Boston where he would remain the pastor until his passing. Starting 1805, Ballou founded, wrote for and edited, various Universalist publications. It is estimated that he wrote more than 10,000 sermons, as well as many hymns, essays and polemic theological works. He also wrote several books including, Notes on the Parables, A Treatise on Atonement, and Examination of the Doctrine of a Future Retribution. "It is well known, and will be acknowledged by every candid person, that the human heart is capable of becoming soft, or hard; kind, or unkind; merciful or unmerciful, by education and habit. On this principle we contend, that the infernal torments, which false religion has placed in the future world, and which ministers have, with an overflowing zeal, so constantly held up to the people, and urged with all their learning and eloquence, have tended so to harden the hearts of the professors of this religion, that they have exercised, toward their fellow creatures, a spirit of enmity, which but too well corresponds with the relentless cruelty of their doctrine, and the wrath which they have imagined to exist in our heavenly Father. By having such an example constantly before their eyes, they have become so transformed into its image, that, whenever they have had the power, they have actually executed a vengeance on men and women, which evinced that the cruelty of their doctrine had overcome the native kindness and compassion of the human heart." Ballou also once wrote, "Real happiness is cheap enough, yet how dearly we pay for its counterfeit." Ballou passed away on June 7th, 1852. Ballou was a member of Warren Lodge No. 23 in Woodstock, Vermont. He also was the Grand Junior Warden of the Grand Lodge of New Hampshire in 1811.